Monday is here again and in some ways I'm ready for it, but in others I'm not...kinda bittersweet. My sister-in-law and her family came into town on Saturday early afternoon. Tony and I accomplished a massive cleaning of the house. I was pretty impressed by the crazy cleaning spree and so glad I had help with all of it! It was really nice hanging out with family just relaxing and catching up. I realize we just saw each other last weekend, but with the party and being around so many other people this gave us some time to just hang out with our two families for a change. I need to share the cake with you all! I am a huge lover of food projects. I'm guessing this goes back to my culinary school days (or probably back to my middle school days when I first started cooking). If you give me a subject, I am happy to jump in and come up with a recipe. This cake all started when Max ordered a slice of Pina Colada Cake from the movie theater a few weeks ago (before cutting gluten out of his diet). The smell of this cake alone made Tony and I week behind the knees. We both could not get this out of our heads! Anyway, we thought it would be smart for us to bake a gluten free cake for her to enjoy being that it is her birthday and you NEED a special cake for a special lady. She is a fan of fruity drinks and really, what better fruity drink is there than pina colada? I really had no frame of reference other than what my 11 year old told me about his slice of heaven that he proclaimed was the "best cake ever". Our description would be that this cake is rich, creamy, moist, dense, velvety and utterly delicious! So, Tony and I just started putting our thoughts on paper and went with it. Don't let the process of this scare you. The cake is actually quite simple. There's more waiting time than cooking time with all the layers in the process. I used Betty Crocker's gluten free yellow cake mix as the base. I wouldn't normally go for a cake mix, but making a cake this big (I doubled this recipe for the actually party) that had to travel was too much to deal with for my first attempt at anything other than my kids birthday cakes. Besides, I did not have that much in the way of flour options in that short amount of time. I will be attempting it at some point though! Line two 9 inch cake pans with parchment paper and spray with nonstick spray. Preheat the oven to 325 degrees. Put everything together in a mixer and blend until completely combined. Bake 50 minutes or until a toothpick inserted in the center comes out clean. Allow to cool in pan for 5 minutes and then remove from pans. Place the bottom layer on the plate you will be serving it from. Place the other cake topside down (you will be flipping it onto the other cake after completely cooled). Poke holes in both cakes with a butter knife (you want the holes to be big enough that the glaze with go into it). 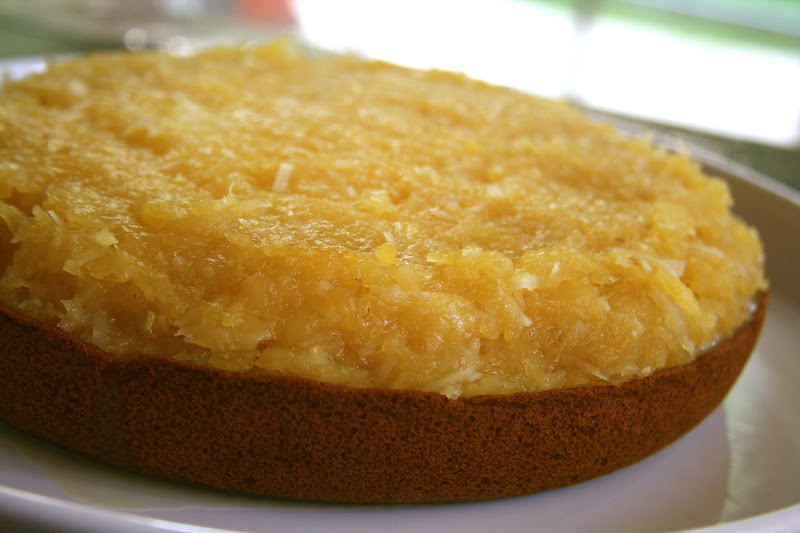 Pour the cream of coconut evenly over the warm cakes. Allow to cool completely, cover and refrigerate over night. 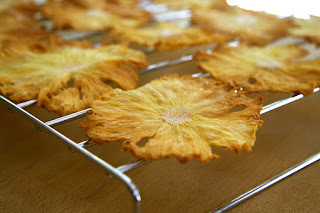 Place pineapple, coconut and sugar in a pot and cook until all of the liquid is cooked out and the mixture is thickened. Cool slightly before applying to the bottom layer of the cake. Place the sugar and water in a heavy sauce pan and heat on medium until the mixture reaches 240 degrees. Stir only in the beginning until the sugar is dissolved. Next, place the egg whites in a mixer with the whisk attachment and mix until slightly thickened. When sugar mixture is ready, pour the hot sugar down the side of the bowl while whisking the egg whites on medium low speed. Make sure not to allow the sugar to hit the whisk (so you don't get burned). 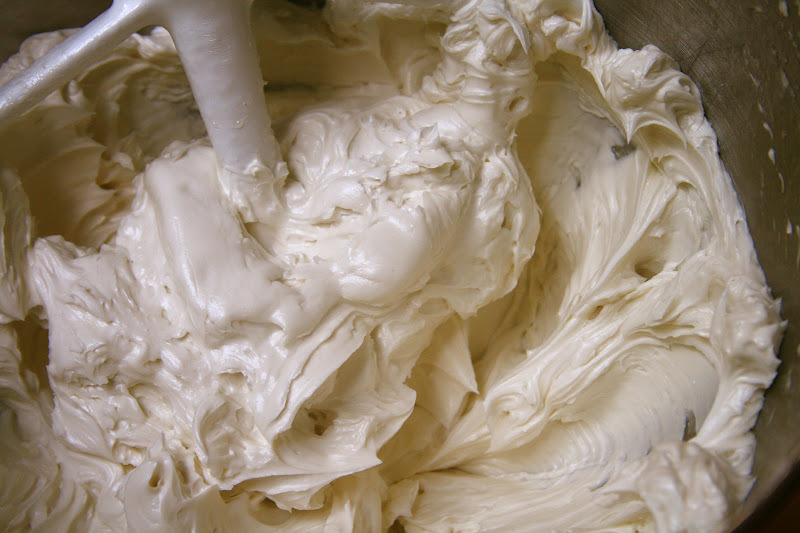 When all of the sugar is in the mixer, bump the speed to medium and whisk until light and fluffy. Now switch to the paddle attachment. Add the Earth Balance a few pieces at a time until all of the pieces are completely incorporated. Add the coconut milk and mix until smooth and creamy. 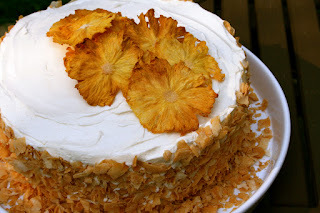 To assemble the cake, flip the top layer onto the pineapple coconut layer. Frost and decorate. This can be made earlier in the day and refrigerated until time to bring out for your event. 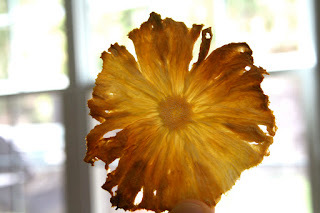 I stumbled upon these pineapple flowers while looking for cake stands, not flowers. I followed Martha Stewart's directions exactly and they came out perfect! Depending on how thick you cut them, some take a little longer to crisp up, but if you watch them, it really isn't a problem. I hand sliced mine, place them on a parchment lined sheet pan, baked them at 225 degrees for about an hour, flipping them halfway through...I was so excited at how pretty they are! You can eat them too! I love edible decorations on cakes! Pretty and delicious! My friend Kristina had the same brilliant idea for her friend's going away party! I also toasted shaved sweetened coconut at 300 degrees for about 15 minutes...watching VERY closely! 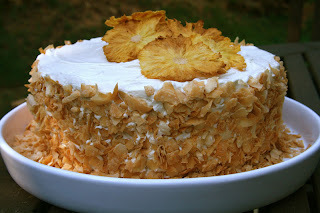 The flavor and texture combination of this cake turned out so well! I will definitely make this again for a large gathering! Since it's perfect served chilled, it makes a great warm weather treat for a gathering with friends! I'm sharing this on Slightly Indulgent Tuesday and Allergy Free Wednesdays. That cake looks simply amazing. How cool on the in another lifetime dream though. I am always surprised you don't have a bakery. Do you have a suggestion for a nonalcoholic sub for the rum? Haha, thanks Heather! I have so many ideas for my next lives...something to look forward to! Anonymous, I would add either pineapple juice or coconut milk. Really, it just adds another tropical dynamic, so making it without alcohol is not a problem at all. I cannot wait to make this cake! *sigh* a reason to have a party, I suppose... ;) a party I wish YOU could come to. I think we were JUST talking about bakery dreams, yes? Jason and I have the same one... perhaps in our retirement! Now that i'm done salivating all over my keyboard... I'm bookmarking this to make for my moms birthday. she will absolutely die of excitement. I love those pineapple flowers too! i pinned that at some point for cupcakes, but they are gorgeous in bunches on this cake too! I love those pineapple flowers! How beautiful!! WOW!!! Looks amazing!! I want that cake for lunch! 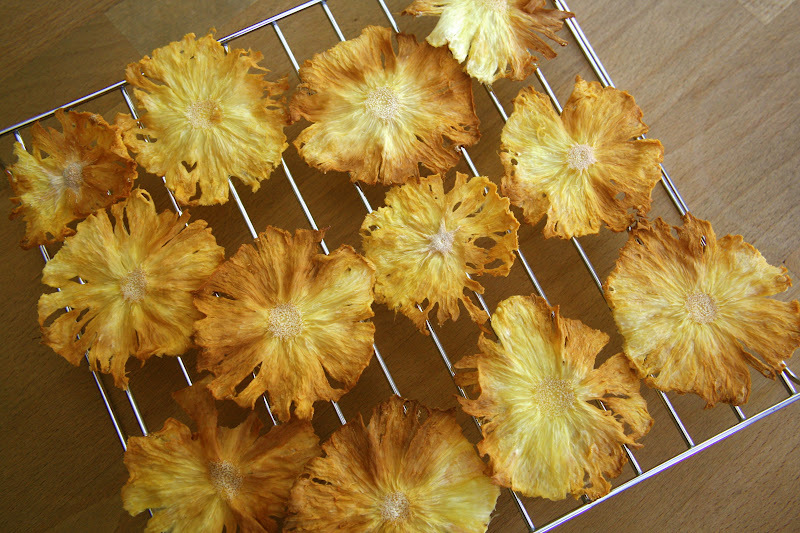 Also, the flowers look gorgeous, again, and I'm happy to see they can be done with just an oven! I would LOVE to make this cake. However, my toddler is allergic to eggs. Do you think an egg replacer would work? I'm not sure if the cake would turn out well with an egg replacer for 6 eggs. Thanks! Food project is right! It really did turn out so cute! Ironically, cakes are my favorite thing to make someone for this reason alone. However, I'm not a big cake person. They're just way prettier than other things like cookies. YUM! you can come back me this cake anytime. I am never in the mood for Mondays but this cake has cheered me up! 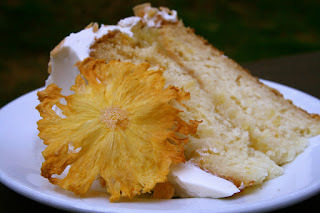 It is just lovely and those pineapple flowers - to die for! I don't even know what to say here except that I am in total AWE of this cake...and I am totally drooling too. LOL That cake has EVERY flavor that I adore in it. This is SO what I am making myself for my birthday. LOL :D I love when you experiment!! Seriously yum! When I am back in a house with a kitchen and not juicing for my dad and keeping sweets out of his sight i am definitely going to make this for me and the hubs! Yummy! Oh man, you and your amazin creations in the kitchen. You need to teach me your ways friends. :) Your peanut butter vanilla concoction looks fabulous also. Go GOO!!!! :) And.. I'm totally jealous of your cleaning spree. YUUUUUM!!! This looks absolutely incredible Sarena!! I lve the flowers! And I agree with Heather up there - I can't believe you don't have a bakery! Beautiful cake! Love the pineapple flowers.